Cheers to the Kristall Buzz Swarovski Blog – 2 Years Online and Going Strong! We are excited to be celebrating 2 years of blogging on the Kristall Buzz. This Swarovski Blog was the first of its kind solely posting Swarovski news, events, and articles for Swarovski collectors. 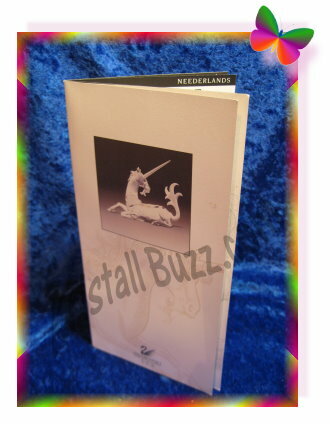 The Kristall Buzz launched on the web in October, 2010. Today, I took a quick photo of the Swarovski SCS Anniversary Cake for a quick picture posting to @CrystalExchange Instagram to use with our anniversary announcement. Also known as the Swarovski Birthday Cake, this figurine was created to commemorate the 5 year anniversary of the Swarovski Collectors Society in 1992. 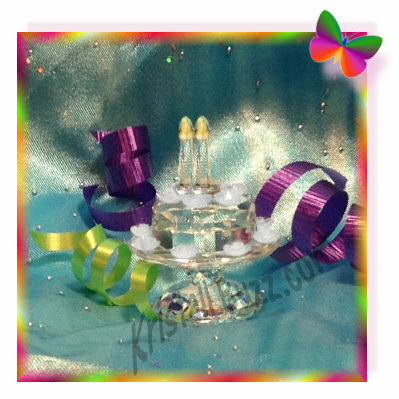 This Swarovski cake is about 2” tall, and originally retailed for $85. It came in a special white cylinder with its own certificate featuring a picture of the cake on it. (It is not generic product booklet.) At present, the 5th Anniversary Birthday cake sells around $175 on the secondary market. Shortly after the Instagram post, one of our loyal customers emailed me an edited version of the Instagram photo reflecting our special occasion. This picture of the cake was digitally edited to show 2 lit candles on our cake! Our appreciation goes out to our readers for the compliments on our Swarovski Blog. And a special thanks for our yummy crystal cake with the pair of burning candles! The first crystal figurine in the Swarovski SCS “Fabulous Creatures” trilogy was the Swarovski Unicorn. The Unicorn is a mystical creature, the 1st non-natural figurine that Swarovski has produced for an SCS figurine. 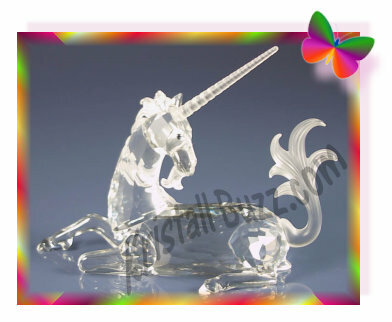 The purpose of the Swarovski Unicorn Box is to safely protect the crystal figurine while it is not on display. The SCS Unicorn is the first SCS figurine to be ‘double-boxed’. The crystal Unicorn is situated in a white box, containing the SCS logo. This white box has a fuzzy green plastic liner form-fitted to the Unicorn. The white box measures 7” x 7” X 3”. The white box is placed into a larger box, held in place by foam glued to the outer box, that is approximately 10” x 10” x 4 ½”. On the 4 sides of the box, in 11 different languages, the text states” Annual Edition 1996 “Fabulous Creatures” – The Unicorn. The Fabulous Creatures Unicorn Box (meaning the set of 2 boxes) can be found using reference # DO1X961B, which was originally used in the Warner’s Blue Ribbon Books on Swarovski Price Guide. There does not appear to be a factory-assigned identification number printed anywhere on the box, inside or outside. 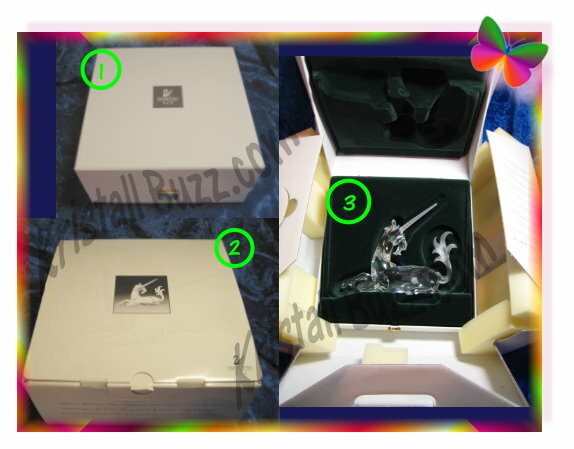 In the photo, #1 is the inner Swarovski Box for the Unicorn. #2 is the outer Unicorn Box. #3 shows the SCS Unicorn placed in the inner box (with the fuzzy green insert), which is located inside the padded outer box. The slot on the left side of the outer box is to hold the Unicorn Certificate in place. 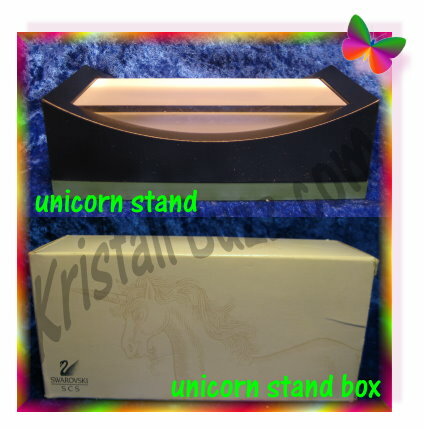 The SCS Unicorn Box is not presently available at Crystal Exchange America; It would be in the Empty Boxes category. Previously, the SCS Unicorn packaging (includes both boxes) has sold in the $40 – $100 price range. Collectors should use care when purchasing the Unicorn in the online auctions or after-market sales agents that they are indeed getting all original packaging, and not simply the inner box. SCS membership had significantly increased over the years…..crystal fanatics were fully engulfed in collecting and secondary market values were at an all-time high in the late 1990’s, which indirectly encouraged collectors to continue spending money on Swarovski, especially the SCS annual editions. The Swarovski Unicorn was well-liked and by now, collectors knew that to retain and increase in value (which was true at that time), the box and certificate must be saved and included for resale on the secondary market. As time passed, the Swarovski annual edition certificates changed to include even more languages The Swarovski Unicorn certificate was now printed to include the “Certificate” wording in eleven different languages: English, German, Italian, French, Dutch, Spanish, Portuguese, Russian, Flemish, Chinese, and Japanese. 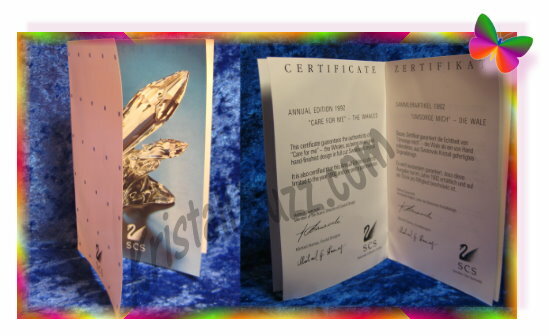 The genuine Swarovski Unicorn Certificate measures 4 1/8” wide and 8 ¼” tall. The picture on the front of the certificate matches the picture on the Unicorn Box. 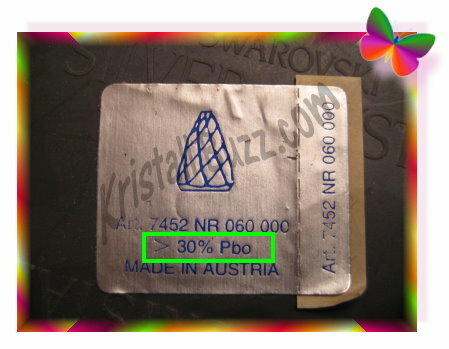 The Swarovski–assigned reference number is printed in a very small font on the back side of the certificate. Officially, the Swarovski Unicorn certificate is DO4MM96XX. The Fabulous Creatures Unicorn Certificate can also be found using another reference # DO1X961C, which was originally used in the Warner’s Blue Ribbon Books on Swarovski insurance price guide. SCS Swarovski Unicorn Certificate is readily available at this time at Crystal Exchange America, the range of $50 – $75. However, there is never any guarantee that the Fabulous Creatures Unicorn Certificate will be easy to find, so we do urge collectors to buy Swarovski SCS AE figurines as a complete package including the original box and certificate. The free web site www.RetiredSwarovski.com shows a list of Swarovski Lovlots that are scheduled to retire by the end of 2012. 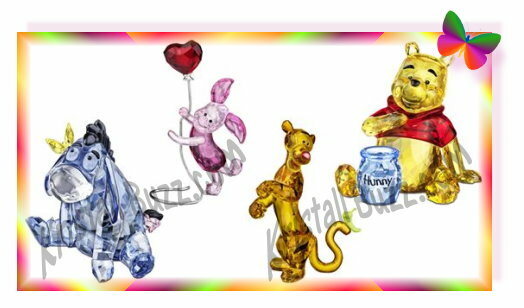 The list contains just over 30 Swarovski Lovlots figurines that will not be offered at Swarovski.com or boutiques in 2013. To me, the biggest surprise was to see the Swarovski Lovlots Bo Bear So Brilliant in the list of retirements. Why? 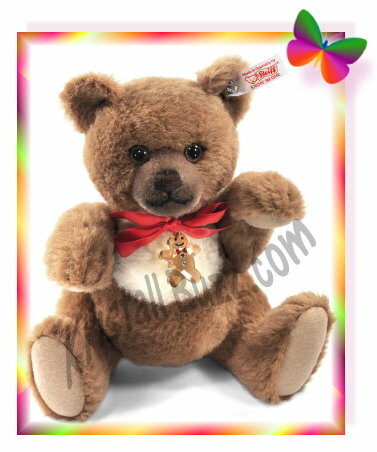 Because the Bo Bear community was just launched in July, 2012. 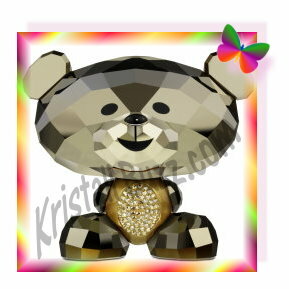 This means that Swarovski is offering this figurine for less than 6 months. While the crystal brand has never advertised this Lovlots as a Limited Edition figurine, I think it certainly could have been! My curiosity is now a bit peaked about the actual quantity produced given its brief availability. For a more complete list of 2012 Swarovski Lovlots retirements, RetiredSwarovski.com is the place to go. To purchase retired or Limited Edition Swarovski Lovlots, check out the “Lovlots and Zodiac” category at Crystal Exchange America’s web site. 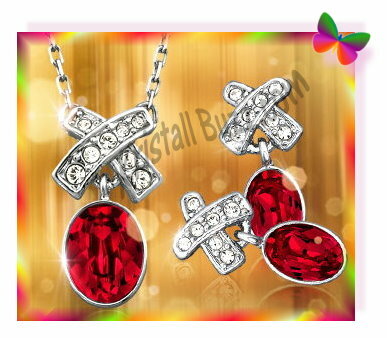 Swarovski fanatics are constantly seeking that rare find, and hopefully at an affordable price. The more rare the find, the more exciting that it is! One such rare Swarovski find might be the Swarovski Pentagon Paperweight, that is seldom found at an affordable price for most collectors. 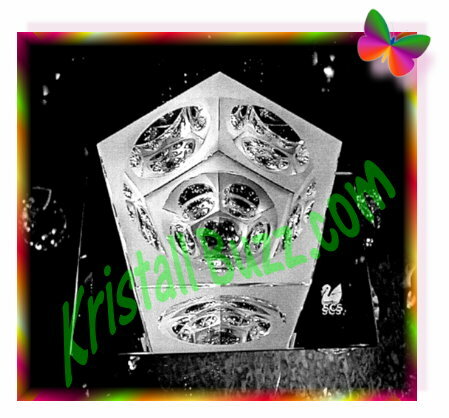 Jimer at Swan Seekers Network sent us an article from her newsletter archives about this figurine for collectors who are uncertain about what the rare Swarovski Crystal Pentagon is. From Maret Webb, who originally wrote about a Pentagon found in Italy, basically shared this: The large Pentagonal crystal, Swarovski item # 9456, weighs 2.2 lbs was designed in March, 1977. Another one was later located in Arizona. One thing that both paperweights had in common was literature, written in German. The translation of the literature they ascertained was…. The original examination date for the design was March, 1977. No one knows for certain if that was a production time or design time since it contains the Swan logo, which was not introduced until 1989. The category description for the Pentagon is “ready product” from the ‘main program’. The literature in German further indicated that the item was produced in Factory #1, which was surmised to be in Wattens. 10 colors of vaporization effect are listed as available, as well as the opportunity for an emblem. (Crystal Exchange comment…these are likely to be the same 10 colors that we find on the colored paperweights like carousels, rios, and pyramids). Suggestion of the emblem leads one to believe that this was a presentation type piece that could be customized upon order and that this is further reference to consultation with the customer. The Pentagon comes in a very nice box with metal hinges and a latch. The box sides can somehow be removed, leaving the Pentagon on a blue velvet pedestal for display. No one knows how many were ever produced, but they are seldom seen. The literature makes reference to a minimum order of 240 units, but it is not clear if that was for the order of which the Pentagon came from or for new orders at that time. Referring back to the group designation “ready product” , one may conclude that the factory produced 240 units at a single time, which would then be available for customization. A special thanks goes out to Jimer at SwanSeekers.com for the Swarovski Pentagon article! According to Warner’s Blue Ribbon Book on Swarovski, the Pentagon is 3 ¾” high. They indicate that the Swarovski Pentagon figurine is also known as the “School Block Paperweight”. I have regularly seen this Pentagon Swarovski Paperweight on ebay, since Feb, 2012. 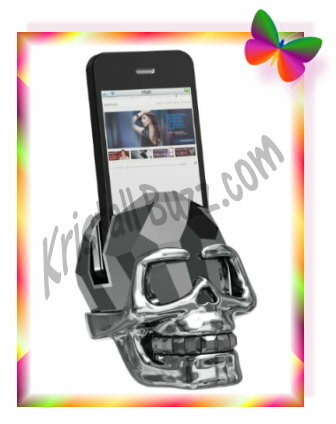 The ebay seller generally advertises with a Buy It Now price of $5700 – $6000 USD. I have not seen this item sell, despite the numerous attempts. The third crystal figurine in the Swarovski SCS “Mother and Child” trilogy was the Swarovski ‘Care For Me’ Whales. The Whales were an enchanting figurine demonstrating a new mother and her young whale calf over an ocean wave. 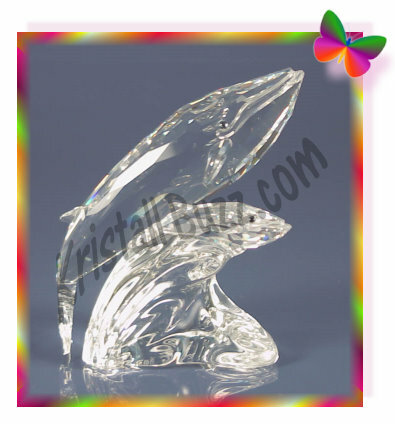 The purpose of the Swarovski Whales Box is for protection and storage of crystal figurine. The SCS Whales Box is a big white cylinder with silver-gray end caps. It is similar to the Turtledoves Box and Dolphins Box, and Seals Box at a glimpse. On the Whales cylinder, collectors can read the text ‘Annual Edition 1992 “Care For Me” – the Whales in English and in 5 other languages on the cylinder container. The Swarovski Whales Box can be found using reference # DO1X921B, which was originally used in the Warner’s Blue Ribbon Books on Swarovski Price Guide. The factory-assigned identification number cannot be found on the cylinder. 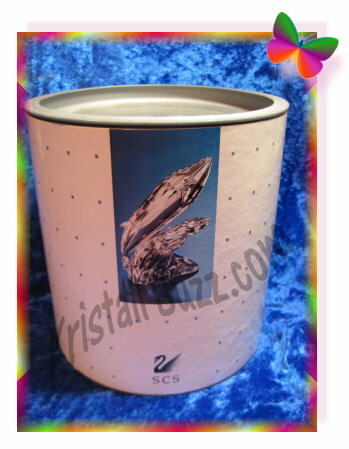 The foam in the cylinder is designed exclusively for the Swarovski SCS Whales figurine. This particular setup employs a single piece of hinged foam with cutouts to perfectly fit the Whales. The Whales Certificate is simply placed on the top foam prior to placing the lid covering. The SCS Whales Box can be found at Crystal Exchange America in the Empty Boxes category. One is available at this time for $125. The Care For Me Whales box includes the original foam insert.